Activision has announced the release of the Call of Duty: Infinite Warfare Sabotage DLC pack on the PlayStation 4. Call of Duty®: Infinite Warfare Sabotage, the first DLC pack for the #1 top-selling video game on console in the U.S. for 2016 (excluding hardware bundle sales), is available now on PlayStation® 4, with other platforms to follow. Published by Activision and developed by Infinity Ward, Sabotage delivers four new, epic multiplayer maps, including the return of one of Call of Duty’s most famed maps from Modern Warfare®2, Afghan, re-imagined for a new generation. 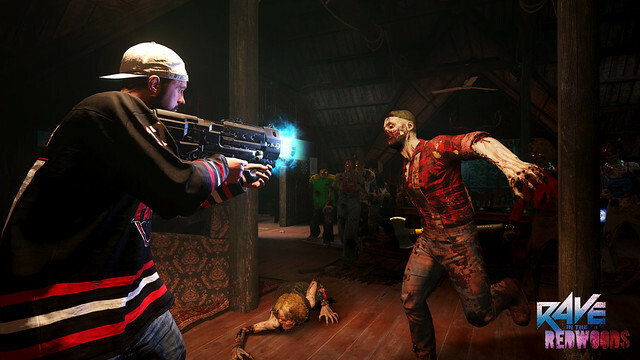 The new DLC pack also features “Rave in the Redwoods,” as Kevin Smith joins the cast in the all-new, ‘90s inspired zombies experience. Sabotage introduces the next thrilling chapter of the Call of Duty: Infinite Warfare zombies experience with Rave in the Redwoods, taking fans through a new storyline taking place in a ‘90s abandoned lakeside summer camp full of wild twists and turns. Filmmaker, actor and podcaster extraordinaire, Kevin Smith (Mallrats, Clerks), joins the cast as himself. Just like the four protagonists, Kevin has been catapulted straight into another twisted horror film helmed by Willard Wyler, the enigmatic movie director villain played with voice and likeness by Paul Reubens (Pee-wee’s Big Holiday, Gotham). Smith has been left for dead in the movie, but through a series of creepy events helps players attempt to escape, where zombie ravers have turned the campgrounds into a techno-fueled nightmare. Renaissance – Set in Northern Italy, Renaissance pits players against each other on the narrow streets of Venice surrounded by classic architecture and buildings. The map promotes continuous action through the canals and neighborhoods of this iconic city. Neon – A virtual training center designed for urban warfare, Neon is a unique, digitized battle arena where cars and other structures spawn out of thin air and enemies dissolve into hundreds of pixels when defeated. Middle-lane sightlines cater to long-range players, while the perimeter of the map allows for quick counter-attacks in close-quarter action. Dominion – A re-imagining of the classic Afghan map from Modern Warfare®2, now set on Mars, Dominion retains all the memorable landmarks and gameplay of the original. Anchored by the crashed ship in the center, Dominion offers enhancements designed to fully engage the new movement system of Infinite Warfare. The Call of Duty: Infinite Warfare Sabotage DLC Map Pack is available now for a great value via the Call of Duty: Infinite Warfare Season Pass, which can be purchased on its own or obtained as part of the Legacy Pro or Digital Deluxe editions of the game. Season Pass gives discounted access to four Call of Duty: Infinite Warfare DLC Map Packs released during 2017 (discount based on a Season Pass suggested retail price of $49.99, and four individual DLC Map Packs at a suggested retail price of $15 each). Season Pass owners will also receive 10 Rare Supply Drops upon purchase plus 1,000 bonus Salvage Credits to craft new prototype weapons.